WTF were the Bears smoking in the last 2 minutes of the game? panzermk2wife wrote: WTF were the Bears smoking in the last 2 minutes of the game? Tony Dungy is one of the best football minds in the game. He has been saying for weeks that Cutler does not have what it takes. 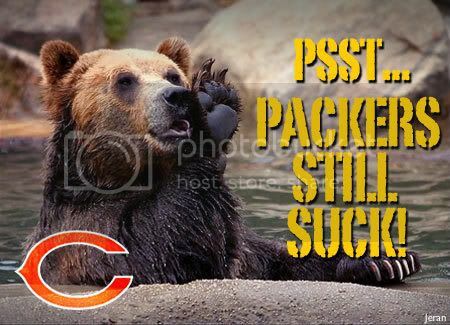 I am sure there are a bunch of head coaches developing their game plan to use against the Bears this year...stop the run, and put Pressure on Cutler. He looked just like Rex Grossman last night. Urlacher's out for the season. Karma after the whoopin' he put on A-Rog? They only won the game because they took him out. Well Dallas looked good except for the penalties. That was pathetic. When anyone else looks at Cutler do they see the kid on Two and Half men all grown up? Plays like it is him slow and goofy. ive been in the new cowboy stadium, i'll say this..... amazing. this was from the open house for arlington residents before the pre season started. not looking forward to traffic though, I live couple miles from the stadium. That damn Jessica Simpson, putting the Hex on the Cowboys! What are the odds you have the crazy plays that went against Dallas last night??!?!?! ?